Preparing to deliver natural gas from Azerbaijan's Shah Deniz-2 and other fields in the Caspian Sea to Turkey and Europe, the Trans Anatolian Natural Gas Pipeline Project (TANAP) is due to start operation on June 12, Energy and Natural Gas Minister Berat Albayrak announced Friday at the 11th Sector Meeting of the Electric Distribution Services Association (ELDER) in the northwestern province of Bursa. The minister stated that the project will start operating with a grand ceremony with President Recep Tayyip Erdoğan, Azerbaijani President İlham Aliyev, other heads of state and ministers in attendance. ​The TANAP project along with the South Caucasus Pipeline that brings Shah Deniz-2 natural gas to the Turkish border via Georgia as well as the Trans-Adriatic Pipeline, which will be linked to TANAP on Turkey's İpsala border, will deliver Azeri gas to European markets through pipes in Greece, Albania and the Adriatic Sea before coming ashore in Italy's south to form the Southern Gas Corridor (SGC), a multinational European Commission project to transfer gas from Azerbaijan's Shah Deniz Gas Field in the Caspian Sea to European markets to reduce the continent's dependency on Russian gas. In that respect, TANAP not only contributes to Turkey's gas supply security by diversifying resources, but will also boost European supply security by enriching the energy resource channel for continental countries. Considered the backbone of the SGC project, TANAP will replace the defunct Nabucco pipeline. TANAP will run from the Turkish border with Georgia, beginning in the Turkish village of Türkgözü in the Posof district of Ardahan, and run through 20 provinces including Kars, Erzurum, Erzincan, Bayburt, Gümüşhane, Giresun, Sivas, Yozgat, Kırşehir, Kırıkkale, Ankara, Eskişehir, Bilecik, Kütahya, Bursa, Balıkesir, Çanakkale, Tekirdağ and Edirne until it ends at the Greek border in the İpsala district of Edirne in Thrace. From this point, TANAP will connect to convey natural gas to European nations. Two off-take stations are located in Turkey for national natural gas transmission, with one in Eskişehir and the other in Thrace. With 19 kilometers running under the Marmara Sea, the main pipeline in Turkey stretches a total of 1,850 kilometers, along with off-take stations and above ground installations. The main line of the project includes seven compressor stations, four measuring stations, 11 pigging stations, 46 block valve stations and two off-stake stations to supply Turkey's natural gas network. At the dawn of the project, TANAP was first estimated to cost $11.7 billion. But some successful procurement, project management and financial management have reduced the cost down to $7.99 billion. TANAP partners received $3.75 billion in loans from international finance institutions including the World Bank, the European Bank of Reconstruction and Development (EBRD) and the Asian Infrastructure Investment Bank (AIIB). The European Union also provided a grant of $10.2 million. Moreover, the pipes used in the project were supplied by six Turkish manufacturers. Eighty percent of the pipes used in the project were purchased from Turkish suppliers, while 20 percent were imported from China. Currently, TANAP has four partners. The SGC holds a 58 percent stake in TANAP, while Turkey's Petroleum Pipeline Corporation (BOTAŞ) and BP own 30 percent and 12 percent, respectively. Seven percent of SGC's stake has been recently transferred to the Turkish subsidiary of the State Oil Company of the Azerbaijan Republic (SOCAR). 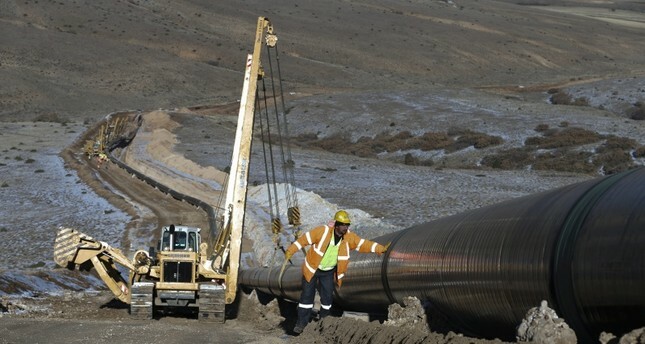 Turkey imports some 6.6 billion cubic meters (bcm) of natural gas from Azerbaijan via the Baku-Tbilisi-Erzurum pipeline and the amount will go up to 12.6 bcm as TANAP brings in an additional 6 bcm of natural gas. Therefore, the share of Russian gas in Turkey's energy imports will decrease. TANAP's initial annual capacity will be 16 bcm, from which Turkey will withdraw 6 bcm; while the remaining 10 bcm will be delivered to Europe. The transmission capacity of TANAP will be increased to 24 bcm and then to 31 bcm through additional investments. During the most intensive period of construction, the project provided jobs for some 13,000 people, of which 7,000 people are still involved in the construction work. Commenting on the political benefits of TANAP, Gulmira Rzayeva, a research associate at the Oxford Institute for Energy Studies, highlighted in her article titled "Natural Gas in Turkish Domestic Market: Policies and Challenges" that the project will contribute significantly to Turkey's growing political role in a wider context in Europe and the Middle East as well as in the Mediterranean, Black Sea and Caspian Sea regions by featuring the country as a strategic energy partner and important transit country. As for the legal issues, at the beginning of the project the decision was to apply the Swiss law but in 2013, the Turkish and Azerbaijani governments decided that the project would be managed under Turkish law. Rzayeva argued that this legal aspect provides Turkey with the advantage of being in control of the legal processes and in financial control since all the revenues, taxes, duties and other payments will be controlled by Turkish law. The project is also considered an important step for Turkey's ambition to become a regional energy hub should Turkey fully liberalize its gas market that is supplied by more partners. More energy infrastructure projects, including liquefied natural gas facilities and storage facilities as well as regulations that provide for re-export will also enable Turkey to become an energy hub. "A hub model for Turkey would include regulations that would enable the country to import gas from neighboring countries into the Turkish gas pool through private companies or active involvement in production projects and to re-export it to the European market. In this case, sales and purchase agreements should not prohibit the re-export of the gas by the supplier," Rzayevva explained. Accordingly, Turkey can become either a physical hub with import and export pipelines, connections with other hubs via interconnections or a commercial hub with bilateral and broker-based trader with exchange trading, financial derivatives and securities – mainly a virtual hub. To that end, the country is working to diversify its energy market by introducing alternative derivatives, Albayrak has previously said. The aim is to build a developed spot market in the country, which aspires to become an energy hub, expanding beyond being a transfer bridge where energy is carried from producers to consumers. To develop a natural gas trading hub that offers reference prices and strengthens Turkey's position in long-term contracts, many experts believe that the country should commit to founding a trading hub to which diversified suppliers ensure gas flow. Turkey will begin its first solo deep-sea oil and gas drilling in the Mediterranean before the end of this summer, Albayrak also said during the meeting. Lauding the country's achievements under a new national energy and mining policy, Albayrak said: "We are also going to great lengths to ensure there is no let-up in this momentum." Resources in the eastern Mediterranean have caused friction between Turkey and the Greek Cypriot administration. Earlier in 2018, the Greek Cypriot administration unilaterally launched exploratory drilling activities in the eastern Mediterranean, despite strong opposition from Turkish Cypriots who argue that the island's natural resources should be explored jointly to ensure the equal rights of both parties. The Greek Cyprus is a member of the EU but is not recognized by Turkey, which recognizes the Turkish Republic of Northern Cyprus. Turkey has begun to focus on oil and gas exploration studies in the Mediterranean and the Black Sea. It has already carried out extensive studies to conduct seismic surveys in the Mediterranean. Albayrak said earlier this year that Turkey intends to do the same for the Black Sea region. "These operations will be followed by further exploration and drilling activities, which will reveal the potential of both seas and contribute to security of supply in Turkey and in our region," he said. Turkey has already undertaken oil and gas exploration using two seismic ships. Turkey's first drillship Deepsea Metro 2 arrived in the country last December. It will be the country's first active drillship and will be used for drilling in the Black Sea and the Mediterranean. The former South Korean merchant vessel was produced in 2011, has a length of 229 meters and is capable of drilling at a maximum depth of 12,192 meters. The seismic detection vessel Barbaros Hayrettin Paşa owned by the Turkish Petroleum Corporation, a subsidiary of the Ministry of Energy and Natural Resources, and a second vessel, the MTA Oruç Reis, have conducted deep-sea drilling as well as oil and natural gas seismic exploration in both seas. The energy minister also emphasized that more than 60 percent of the world's oil and natural gas resources are located in Turkey's region, noting that the country is entering a new era and taking significant steps in making new energy investments.